Here's an example of the jersey above from 76. My question is was the leaf screen pressed on?? The reason I ask is because I have a nike and it is screened on and I was just wondering if this is how the actually the jerseys were made. I know the jerseys worn in the 1980's and even into 1991 had the screened on leafs but I'm not sure about the 1970's versions. I would imagine so though. That seemed to be the standard back then. 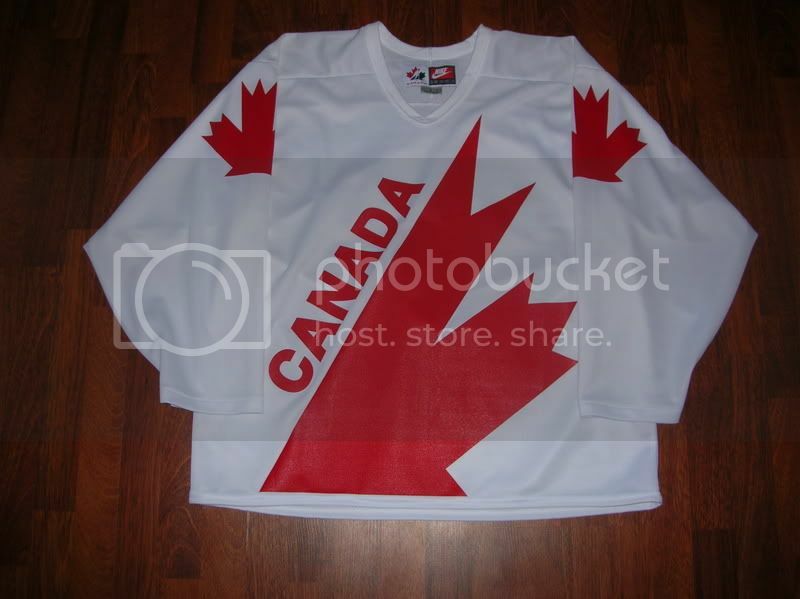 The CANADA and Leaf part was screened but the customization was twill. Here's an absolutely beautiful example. The only thing I'm wondering is when Nike made the Team Canada jersey with a screened on logo. Got any pictures you can show us? Favorite Jersey(s):Mario Lemieux 1991-92 "3 patch" skating Penguin road black. I want to get mine customized as well. Where did you take the jersey to have it customized. 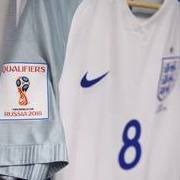 The numbers dont look like they are sewn the way they are done these days. I just want to make sure I send it to a company that knows what they are doing. My lettering was ordered from Stahl's and taken to a local shop for sewing. It's all pretty basic so anyone should be able to do that one accurately if supplied with some decent pictures. It's a pretty standard font, isn't it? I think that's the same one that teams like Buffalo and Pittsburgh and Los Angeles used as their base color for their numbers. The name font was used a lot too by late 80's/early 90's teams like Montreal, Edmonton, Chicago and such. that orr jersey is a knock off, take a look at the bottom of the leaf and notice how it is blocky compared to the nike replica. all the canada cup jerseys from 79 to 91 were all screened on only the names and numbers were sewn on . 76 jerseys were made by i believe athletic knit , and from 81 i believe were made by ccm. 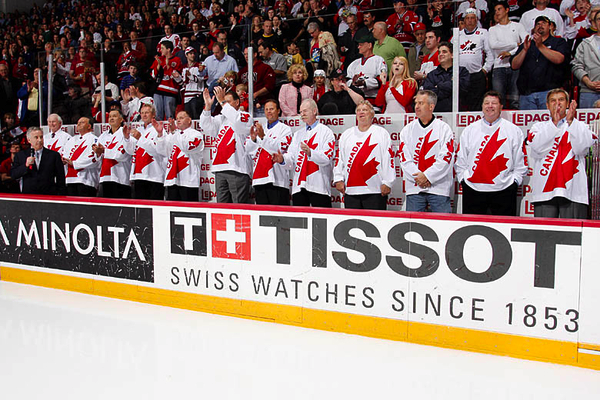 Nike did these jersey as a commerative or heritage jerseys and were used only once during the junior worlds. another tidbit is that during 76 they had sleeve numbers and after that the sleeve was not crested with a number. 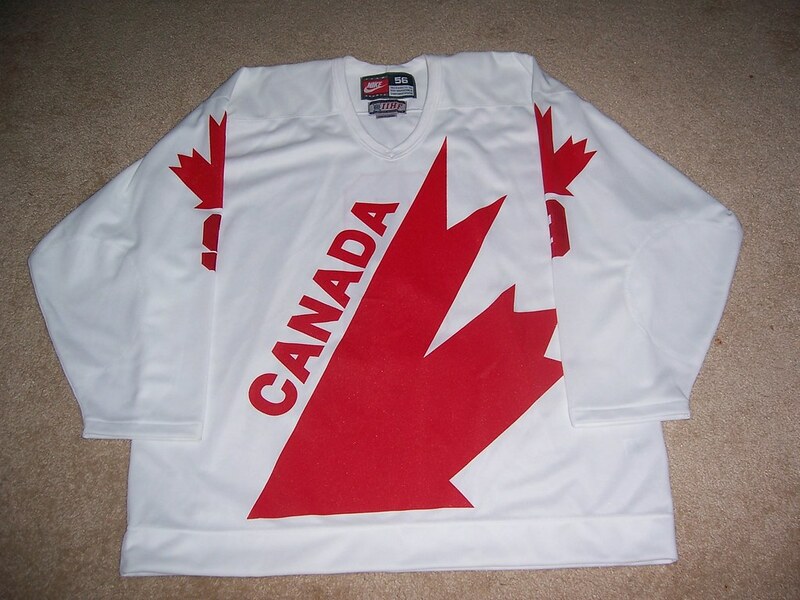 Just arrived yesterday, an authentic 1976 Canada retro jersey they used in the World Championships in 2008. Worn by Bobby Hull when they honored the 1976 Canada Cup team before the game. 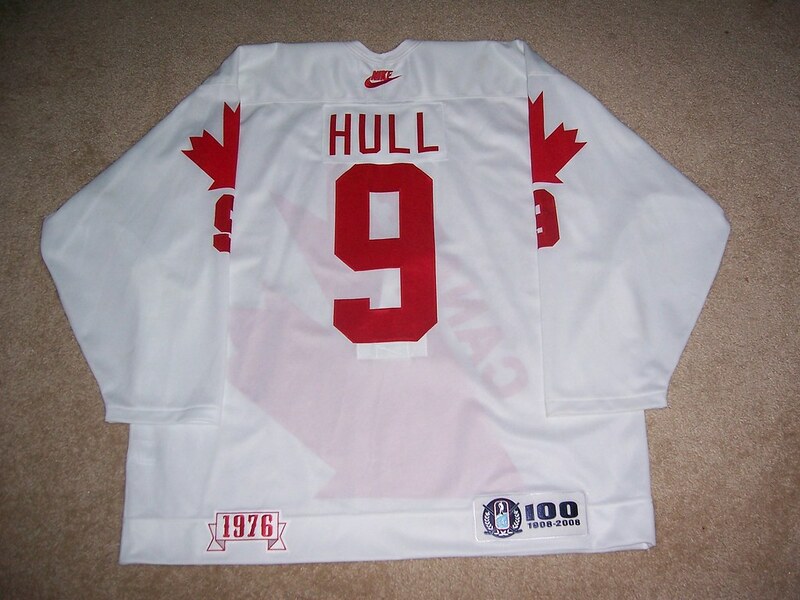 Jersey came with letter of authenticity from Hockey Canada that it was the jersey worn by Hull. It is pro weight, the material reminds me of Ultrafil and has some weight to it. The shoulders and elbows are double padded. The jersey design is not a Nike Swift. The Leafs and "Canada" are screened on the jersey and the nameplate and numbers are sewn on. 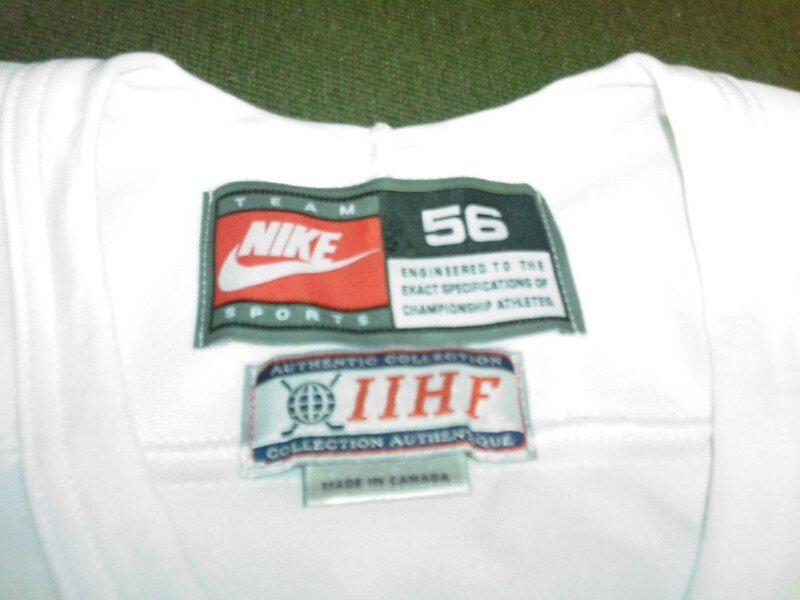 The 1976 and IIHF 100 patches are sewn on the hem. The Nike with Swoosh is embroidered below the neck. I'm trying to collect as many of the retro jerseys Nike used in the 2008 IIHF WJC but it has been very hard for me to find them. The build quality of this jersey really surprised me. It put together very well and the way the logos were screened looks like it will last a long time and never crack. Question about the back hem CCM patch on the 91 Canada cup Air-knit jerseys. I know the GI jerseys had either solid red or white CCM patch on back. What about the ones that where "red,red,blue". still air-knit and sublimated leafs and such. Are they Retail authentics?? I've got a original team canada 76 jersey #4 without ORR on the back, that my granfather got from a cananadian cousin. Both he and my father have worn it and it has been passed on to me some years ago. I really love it and I use it quite a lot. Color is a bit faded but the fabric is undamaged. 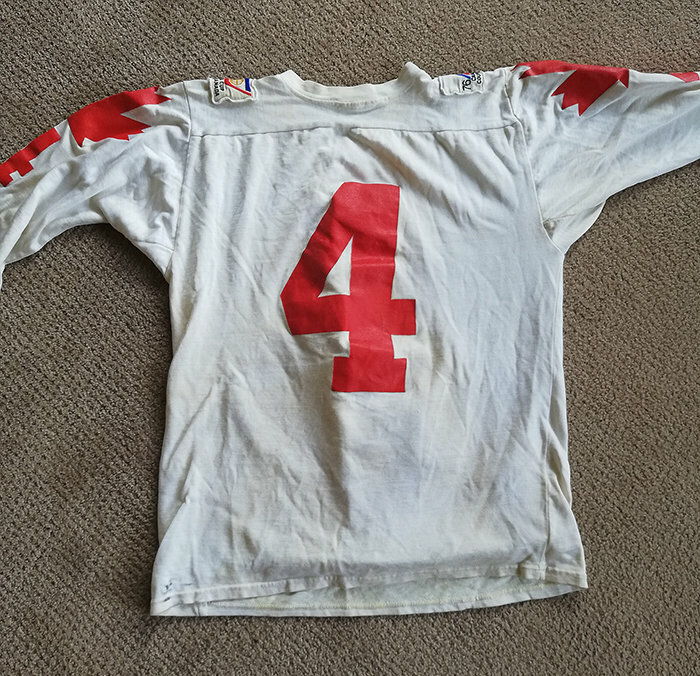 Is it hard to find a similar vintage jersey? Favorite Team(s):canucks.. team italy. North korea. can anyone here tell me a little about this ?? is it worth anything ? ?